I need to get out of the house, you say to some friends. Okay, let’s go on a nature walk, they say. Sounds good, you say, let’s take the train downtown. 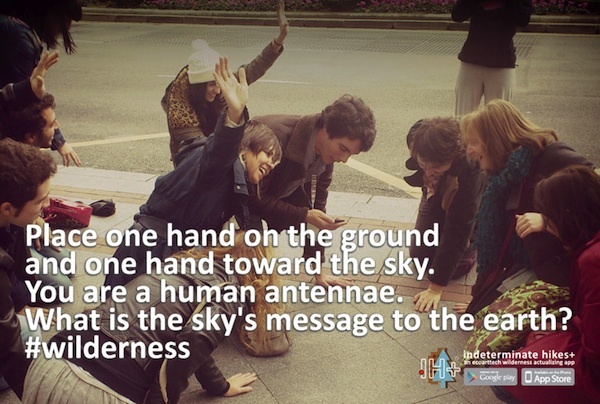 Taking a nature walk downtown is an idea you might not hear too often–unless the speakers are using the eco-art app Indeterminate Hikes+. To most people, a nature walk spent in the city would be a waste. Nature is out there, a destination to be travelled to. It is forests and bogs, fields and streams. It is definitely not buildings, sidewalks, bridges, or cement. To connect with nature we need to leave our built environment, turn off our distracting cell phones, and retreat into the unspoiled ecology that we have lost touch with. 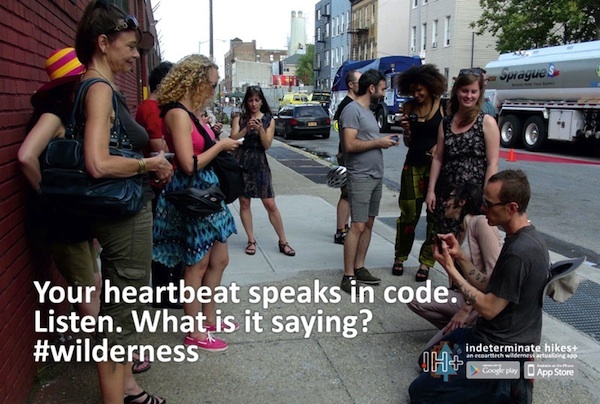 Image of Indeterminate Hikes+ Performance, Bushwick, Brooklyn, EcoArtTech (Leila Nadir + Cary Peppermint), 2012. Indeterminate Hikes+ serves to confound these common assumptions. The app, which is part environmental statement, part social experiment, and part art, asks us to reconsider our notions of place, environment, nature, and technology. IH+ was created by the new media art duo Leila Nadir and Cary Peppermint, who together make make up EcoArtTech. Nadir is a critic, scholar, artist, and creative writer who specializes in the intersection of environmentalism and the humanities, while Peppermint is a media artist whose work examines the effect of online spaces on our imagination of the environment. As EcoArtTech they have created architectural interventions, net art, public performances, and multiple other projects involving the relationship between media and the environment. Indeterminate Hikes+ appears, at first, to be modeled after other map-based travel apps, but unlike its predecessors, IH+ focuses on the journey rather than the destination. Following the familiar Google Maps formula, the user enters their location and destination. Unlike Google Maps, however, IH+ formulates a random, often circuitous route. Along the way the “hike” is interrupted by prompts. Users might be instructed to shake hands with a non-human animal, smell the wifi, or take a picture of something wild that will not be there tomorrow. They might be encouraged to take a picture of their findings or text them to a friend. They might even be instructed to stop the hike and turn off their phone for the rest of the day. These “scenic vistas” are designed to slow users’ pace, expose unseen ecology, and re-embed us in our environment. 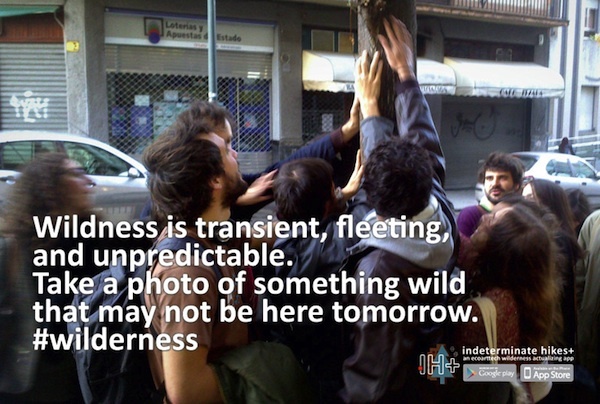 Indeterminate Hikes+ Performance, AlhóndigaBilbao, Bilbao, Spain, 2012. Though IH+ offers a fun and creative platform to engage with one’s surroundings, it also serves urgent environmental purposes. As Gary Snyder reminds us, “Our relationship to the natural world takes place in a place and must be grounded in information and experience.” Without this awareness of the places we inhabit, we will inevitably continue to destroy them. By placing activities traditionally associated with “nature” in an urban setting, IH+ dissolves the barrier between supposedly un-natural urban spaces and natural ecological ones. It demonstrates, through active participation, how a city can be as much of a wilderness as a state park, and helps urban dwellers re-imagine their home as part of nature. As Snyder says in his description of the bioregional movement, the process of re-embedding oneself in place “is not just a rural program: it is as much for the restoration of urban neighborhood life and the greening of the cities” (42). The first step to preserving one’s environment is acknowledging its ecological significance, whether it is a cabin in the woods or a studio apartment in Brooklyn. IH+ also challenges the role of technology in our lives, as smartphones become a symbol of distraction and consumption in an increasingly mediated society. Digital media scholar Jason Farman, in Mobile Interface Theory, claims that “Throughout the history of technology, we have attempted to distance bodies and spaces as much as possible.” As we spend more and more time in virtual technological spaces, our physical ecological home is becoming increasingly secondary. Citing new digital technologies to be especially problematic, he continues: “This dissection is particularly noticeable in the age of the mobile phone, in which we attempt to dislocate bodies from particular spaces and spaces from particular bodies” (19). From an environmentalist’s perspective, this divorcing of mental space from physical place paves the way for further environmental disregard. IH+, however, wonders if technology can be used to reverse this process. It repurposes the features of smartphones that degrade our sense of place in order to increase awareness of the local. Instead of using digital maps to bypass our environment in the fastest, most efficient way possible, IH+ uses them to explore and connect to the actual spaces that the map represents. Instead of using texts and pictures to shift our attention to an absent other, it uses them to remind us of the unique aspects of our local place. Because of IH+’s experimental nature, an individual’s experience with the app will inevitably vary, producing widely divergent but equally valid reactions. Some may notice novel and engaging aspects of their surroundings that had been previously overlooked. Some people may find technological mediation of nature to be confusing or distracting. Most likely users will experience a little bit of both. IH+ does not attempt to definitively answer questions about the way we imagine nature, or the role of technology in our environmental consciousness. Instead, it attempts to ask them in a unique, engaging, and profoundly modern way. Jason Farman. 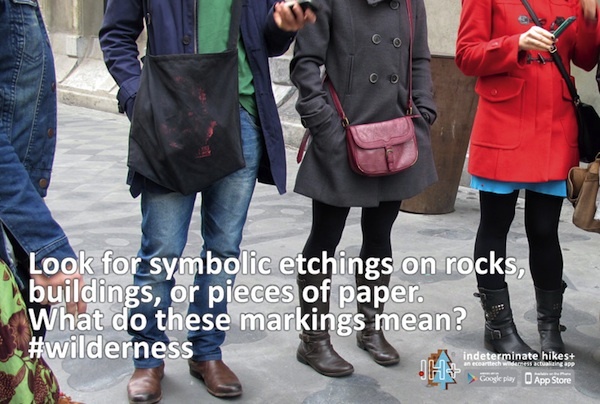 Mobile Interface Theory: Embodied Space and Locative Media. New York: Routledge, 2012. Gary Snyder. Practice of the Wild. New York: North Point Press, 1990. Terrific post Hayden. If you decide to go to grad school to study ecomedia you should apply to be an assistant editor for this site.